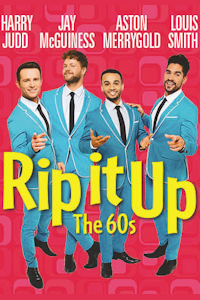 Rip It Up - the 60s tickets at Garrick Theatre, London. 2019. Find the best Rip It Up - the 60s dance or ballet tickets at Garrick Theatre, West End. The ultimate Strictly boy band of dance bring the 60's smashing into the 21st century and Rip It Up in an explosion of song, dance, acrobatics and amazing visuals! Aston Merrygold (JLS) and Jay McGuiness (The Wanted) sing, while Harry Judd (McFly) is on drums and Olympic champion Louis Smith performs amazing gymnastic feats. But what shines through the most in this spectacular show is the fab four's phenomenal dancing talent. The boys are joined by an incredible cast of dancers, singers and musicians, in one of the most energetic shows to ever hit the West End stage. Dance the night away with music from the legends who shook a generation! Valid to Tue, 30th April 2019 23:59. Performers Louis Smith, Jay McGuinness, Harry Judd, Aston Merrygold. Thursday, 7th February 2019 to Sunday, 2nd June 2019. Open 12th Feb 19. 8 suppliers have been found to try and help you to get the best ticket deal. Terms: SAVE UP TO £25 ON TOP PRICE TICKETS £65 now £40 £45 now £30 Valid Wednesday to Friday and Sunday evening performances until 19 May 2019. Excluding 10 - 20 April 2019. Terms: Valid Wed,Thu,Fri & Sun Evenings until 19 May 2019.. Excludes 10-20 Apr. Rip It Up - the 60s tickets: The tabs above allow you to select between links to suppliers and date searching. Click on a supplier's logo to see their details and on the 'buy now' button to see and check the tickets on offer.